There will be a long-coming debate on the right, and between right and left, on U.S. foreign policy in the post-9/11 and post-Arab Spring world. Sen. Rand Paul (R-Ky.) doesn’t like the word “isolationism,” but his policy choices (removing bases, bringing troops home, ending foreign aid) bear an uncanny resemblance to the foreign policy of those who, well, are isolationists. I have written that his ideological partisans at the other end of the intervention/isolation spectrum have not done a bang-up job of justifying their views, formulating reasonable policies, or carving out a proper balance between the executive and legislative branches. This was of course greatly impeded by an Obama administration that is the least transparent in history and has a nasty habit of subsuming foreign policy to electoral politics. The term “isolationist” is a pejorative used by neo-conservatives to scare Republican voters into giving them carte blanche to do pretty much whatever they want on foreign policy under the guise of the “war on terror.” But isolationism has two major components, neither of which apply to Sen. Paul. The first is a complete withdrawal from world affairs, which would seem to be the sole argument — if we can call it that — for Rubin claim. But during his speech last month at the Heritage Foundation, Sen. Paul explained, “Foreign policy is uniquely an arena where we should base decisions on the landscape of the world as it is…not as we wish it to be.” He recognized the potential for foreign threats, specifically Iran and its potential nuclear capability. Sen. Paul explained that he wanted a “middle path” on foreign policy, one that was “reluctant” and “restrained by Constitutional checks and balances,” but also doesn’t appease potential threats. Sure, Sen. Paul has called for an end to foreign aid, but he’s made excellent arguments for that policy. For example, he pushed an amendment last month that would have barred the Obama Administration from giving F-16s to Egypt. Why? Because of the country’s deteriorating domestic situtation, which could represent a threat to Israel, a nation that Sen. Paul believes the United States should assist when its attacked. Sen. Paul’s foreign policy views are constitutionalist in nature because he believes in national defense and the need to assist our allies should they under be attacked. How is that “isolationist”? The second component of isolationism is ending trade. 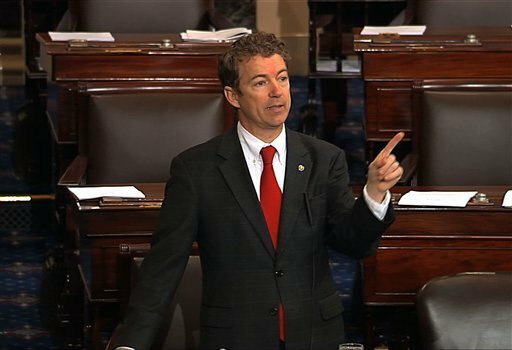 In 2011, Sen. Paul voted for each of the free trade agreements — Korea, Panama, and Colombia — that came up in the Senate. Those are hardly votes that an so-called “isolationist” would make. It’s true that non-nterventionist haven’t been laid out their thoughts very clearly, but Michael Scheuer and Chalmers Johnson have explained the counterproductive effects of the prevailing, though diminishing, foreign policy viewpoint of conservatives. And there is already a document that carves out a proper balance between the branches of government. It’s existed for 224 years. It’s called the Constitution. Only Congress has the authority to decide when we go to war. Unfortunately, we’ve seen those balances blurred by past administrations. That brings us to our current administration, which has taken the executive power it inherited and expanded upon it. There’s just no real basis for Rubin’s arguments. It’s a lazy, weak attempt to try to knock a rising star in the Republican Party who has clearly shaken up the establishment.